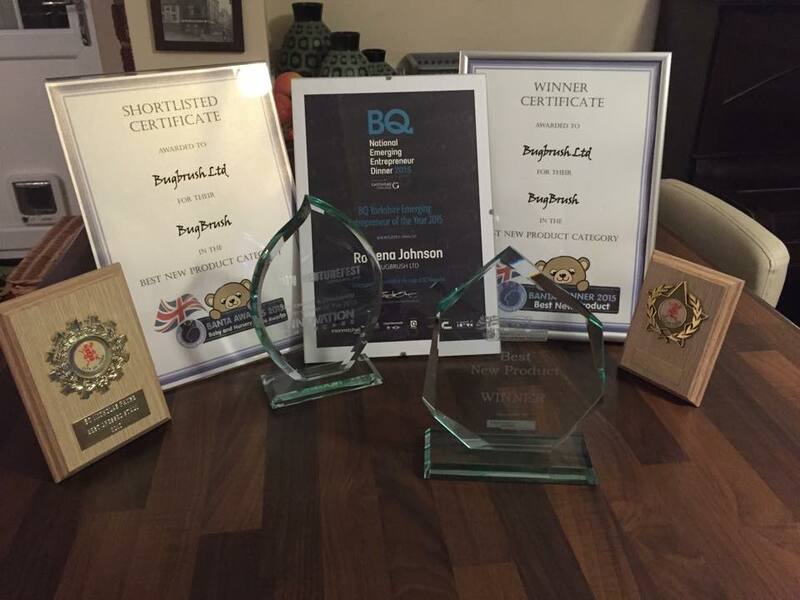 BugBrush Ltd was founded by Rowena Johnson, the inventor of BugBrush. After struggle to find a product that a children could use to clean teeth independently, she set to designing one herself. After 7 years of blood, sweat and tears , the revolution is finally here. Baby start brushing independently since 6 months? Did you know your baby’s teeth are in fact just as important as adult teeth? 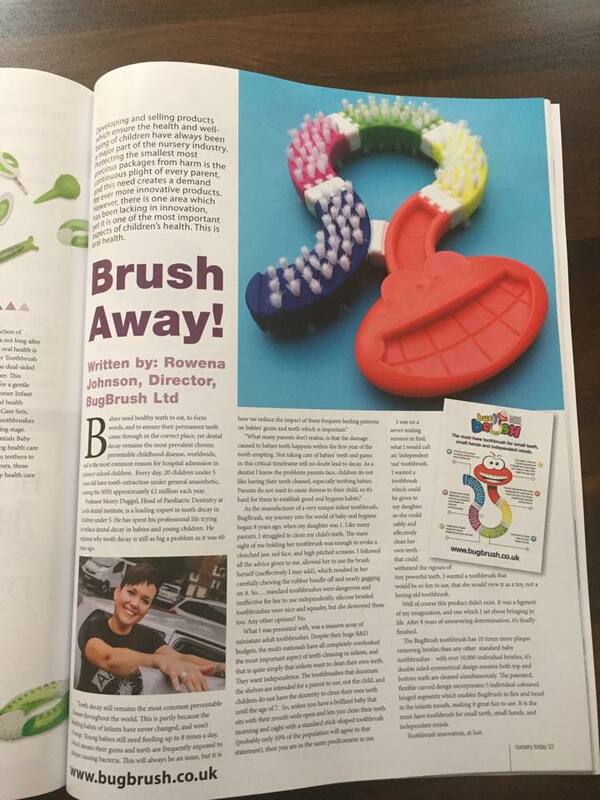 BugBrush is an evolution in toothbrush design, empowering young children and babies to independently clean their teeth. You may be surprised to read that standard shaped toothbrushes are only intended for parents to use, not your child. They actually pose both a choking hazard and palette injury risk; but every parent at some point will have given their child a toothbrush to play with. 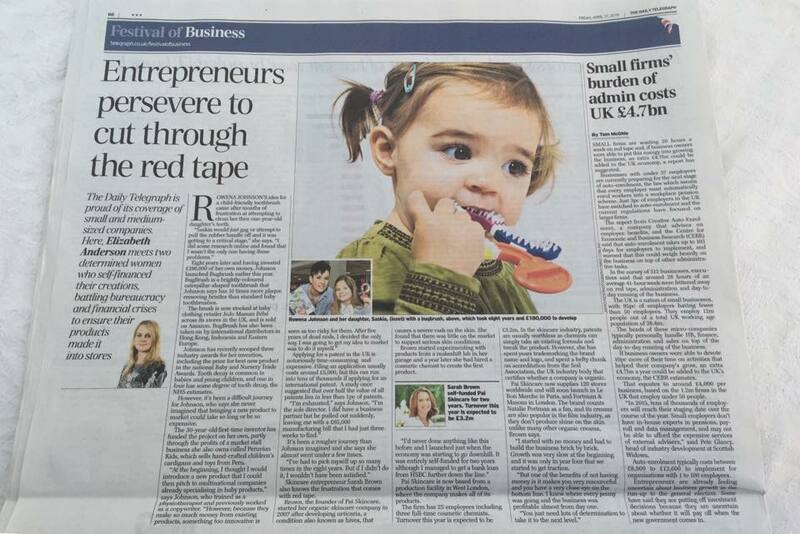 This is because quite rightly, you want your baby to get used to the feeling of toothbrush bristles in their mouth. BugBrush is actually the only product in the world that enables your child to become accustomed to the feeling of bristles in a safe way, enabling teeth cleaning routines to be established. The bristles are just 5mm high, the exact height of a milk tooth, and are distributed in a way that cleans teeth when moved back and forth in the mouth, as opposed to the traditional up and down direction, meaning that chewing and biting down on BugBrush will remove plaque. 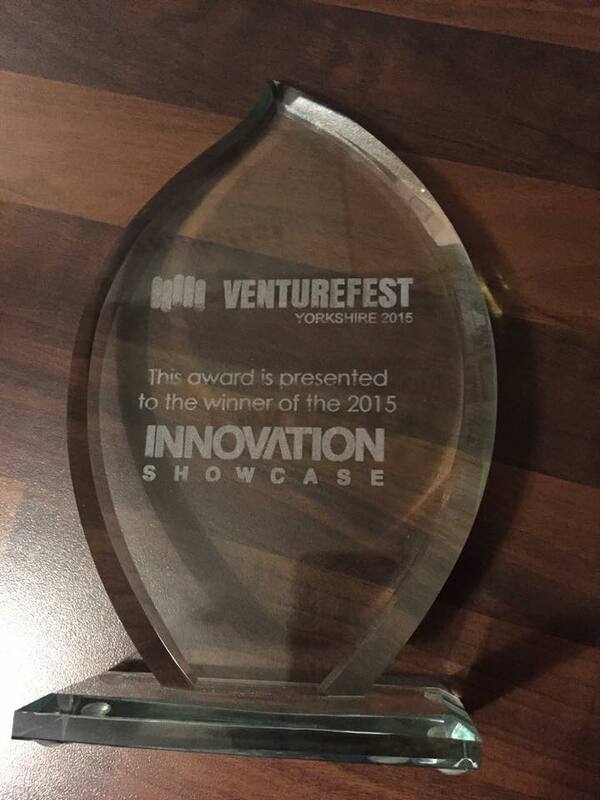 BugBrush was designed with a clear mission - to make teeth cleaning a stress free, fun experience for both parents and infants. 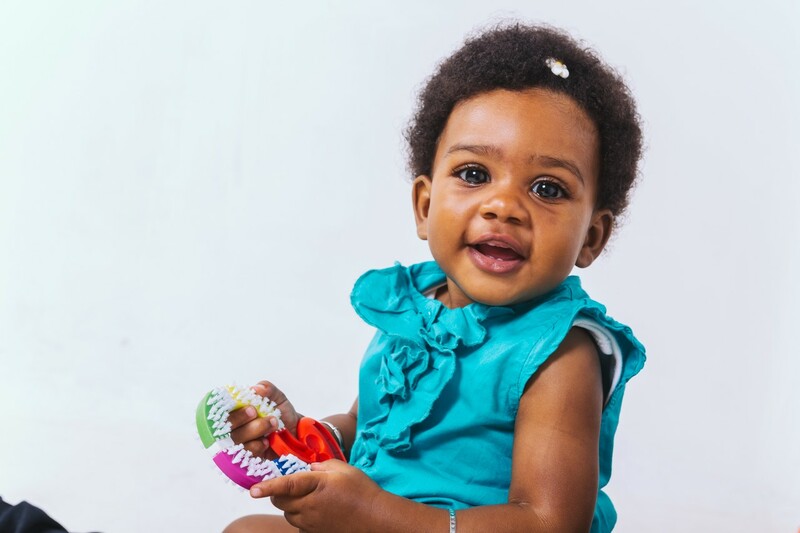 Tooth brushing is a twice daily, necessary task that every parent has to undertake, whether your child likes it or not, and this is all too often a battle which results in an angry, crying baby, and a stressed out, anxious parent. The key to solving this battle was to develop a product designed especially for babies, to be used by babies. 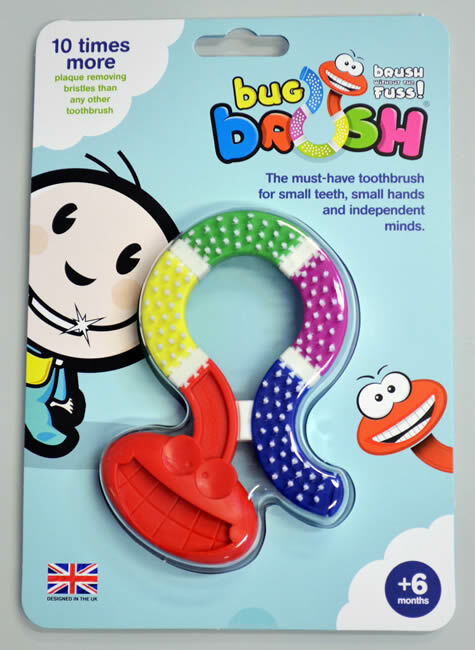 BugBrush is the first product to combine the plaque removing effectiveness of toothbrushes, with the fun and safety elements of a toy, empowering infants to effectively clean their own teeth. 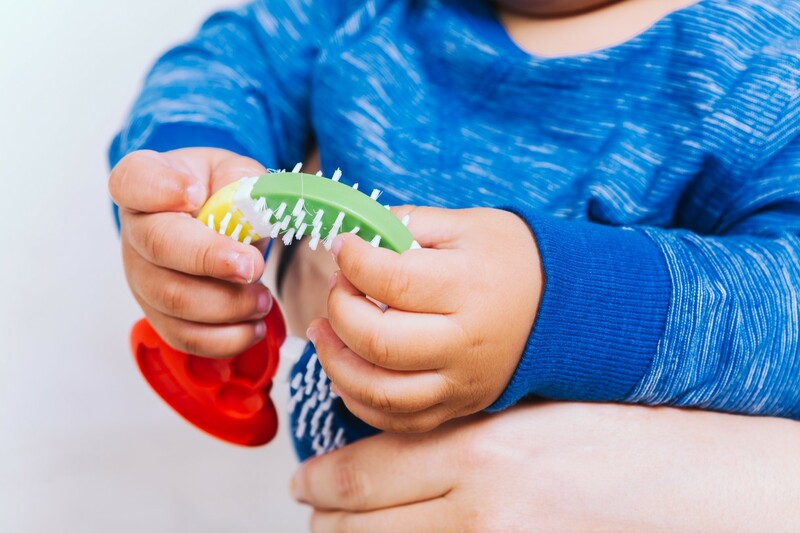 With 10 times more super-soft bristles than any other toothbrush in the world, it’s double sided symmetrical design encourages infants to bite and chew on its surface, removing food debris and plaque, in turn reducing the chance of tooth decay. 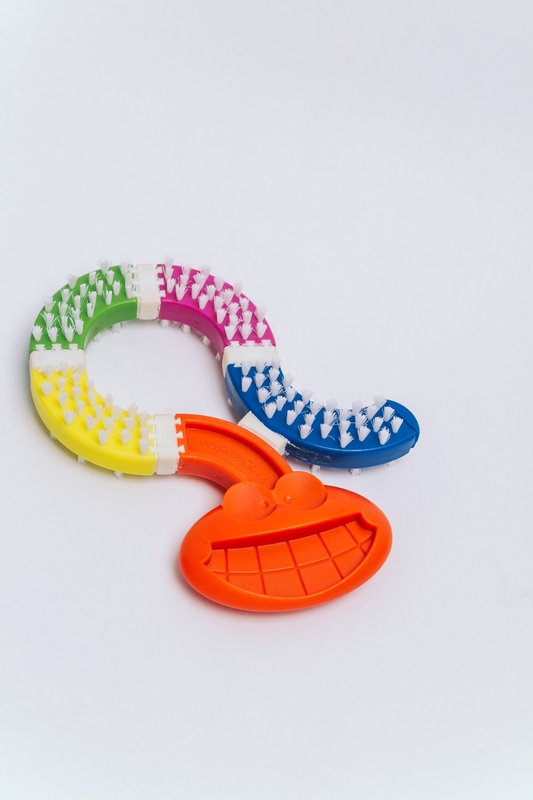 It’s colourful ergonomic shape and smiling face ensures that teeth cleaning tantrums will be a thing of the past. Baby toothbrush evolution, at last.